Start by connecting the SSD to your computer with a dock or cable. Once it’s connected, launch Disk Utility (searchable through Spotlight), and select your drive from the left sidebar. Then, head to the Erase tab, and click Erase. No need to change any settings, unless you’d like to give it a new name. This will format the drive and prep it for the next step. Launch SuperDuper, and set it to clone your Mac’s hard drive to the SSD. If you gave it a new name in Disk Utility, it’ll show up as such. Then choose Backup All Files, and click Copy Now. This could take anywhere from 30 minutes to 3 hours depending on how much you have stored on your hard drive. When the process is complete, eject the SSD and shut down your computer. In case you missed it in the previous step, shut down your computer. Begin by removing your MacBook’s back cover. There are 10 screws in total, including three longer ones. Put them in a small container as you remove them. When the cover comes off, touch a metal part to release the static electricity. At this point, you might want to clean the inside of your Mac. I found that after years without cleaning, mine was full of dust. Use a soft brush or gentle bursts of compressed air to release the dust and grime. To remove the hard drive, use the regular screwdriver to unscrew the two black screws belonging to the bracket securing the hard drive. Remove the bracket and set it aside. Gently lift the hard drive. You’ll see that a ribbon is attached to one end. Carefully wiggle the connector — not the ribbon itself — to disconnect it. Remove the four torx screws attached to the hard drive and set aside. 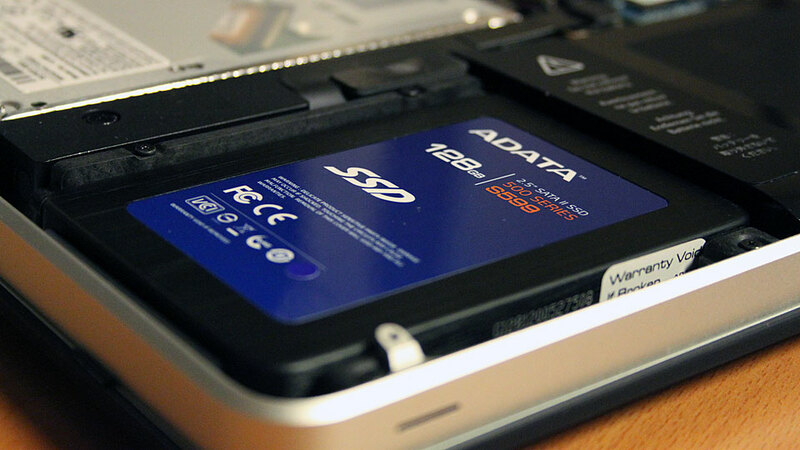 At this point, you can store your hard drive away or convert it to an external hard drive. You’re done with it. Grab the SSD and screw in the four torx screws you removed from the hard drive. Then, carefully attach the ribbon to the SSD, and insert the drive in the same configuration as the previous drive. Re-attach the bracket. And finally, replace the back cover using the 10 screws. If you made it this far without fumbling, congratulations! That was probably easier than you were expecting. Now turn on your computer. It may take a couple of extra seconds as it gets acquainted with the new drive, but generally speaking, starting up your computer will be much faster than the past. You’ll also notice that programs launch faster, saving files takes less time, and it feels less sluggish overall.